New dragons and old friends all in one! Erik is a scientist, tracking migration habits of hawks. He never expects to meet up with Bard, a man with a lot of secrets, and a pair of beautiful creatures Bard calls dragons. Can dragons be real, and how can they have hidden from the world for all these years if they are? Bard bonded with his dragon companion, Chaya, when he was just a child. Her twin sister, Kaya, has never had a bonded of her own, and she chooses Erik. Which means he and Bard are now coming together mentally and physically as mates. Bard never thought he would mate with someone who was not of the People, but he finds Erik irresistible. Something big is coming, though, a storm the dragons fear no one will survive. Erik and Bard must prepare even as they learn to love, but their time may run out too soon. 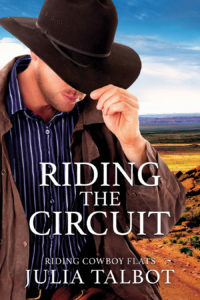 My next upcoming release is an all new installment of the Riding Cowboy Flats series called Riding the Circuit! Available June 7, but up for preorder here now!